The Nevada Bar Association said earlier this month that it had received a complaint against personal-injury lawyer Glen Lerner, and that it was investigating. Lerner is extremely well-known in Nevada, largely because of his ridiculous TV commercials, which have shown him (among other things) spinning like the Tasmanian Devil and dropping a giant phone on litigation opponents. 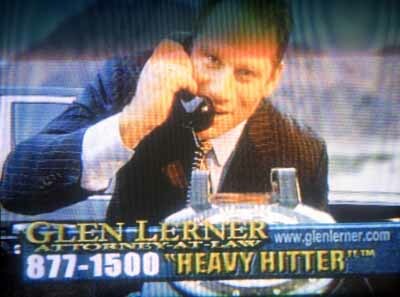 He was featured here some time ago after the state bar told him to stop calling himself "The Heavy Hitter," saying it implied a guarantee of success, and he threatened to sue. The bar seems to have backed off on that one — the Nevada Supreme Court changed the state rules last year, saying that the First Amendment precluded rules against "bad taste" — but Lerner may have a bigger problem with this complaint, which involves his failure to show up for a client’s trial date. Lerner was scheduled to represent his pool cleaner, Mario Lino, in a trial that was supposed to start on January 22. Lerner did not show up, saying he was out of state on "sabbatical." Lino is charged with murder. Lerner had told the prosecutor that he would not be returning for the trial, and said "if the judge wants to sanction me, she can sanction me." (She does in fact want to sanction him.) Lerner told a reporter he had tried to work out a deal with the prosecutor, or at least a continuance, but did not get either. Solution: don’t show up. "The judge is probably fuming," he admitted. "But what could I do?" Well, "you get on a plane and you fly back," suggested the judge (in Lerner’s absence), but could only re-assign the case to the public defender. Lino (right), who faces life in prison for murder, plus a possible concurrent sentence for that haircut, said that no one from Lerner’s office would return his phone calls. Lerner told the reporter that he’s been on "sabbatical" for several months, during which he has been writing a book and "re-examining" his life. "I’ve been living the life of a rock star for so long," he said, that it was time to unwind and think about things a bit. That’s why he had not had time to prepare for the murder case. He claimed that by not appearing for the trial, he was acting in his client’s best interests. That is probably a true statement, but not the way he meant it. This Nevada law blog (which has a separate category devoted to Lerner), has a clip of his most recent ad, which depicted a young Glen Lerner representing the victim of a bully in a schoolyard dispute. In the "dramatization," the young Lerner forced the bully to hand over his shirt and bike as compensation for a bloody nose. In real life, of course, the adult Lerner did not show up for his client’s murder trial.